Eight years after immigrating to the United States, German-born Lukas Ley embodies the American dream: successful athlete, gorgeous girlfriend, loving family. But beneath the surface, eighteen-year-old Lukas is driven by ambition, resolved to avenge the murder of his father at the hands of the Nazi regime. Unfortunately, a failed physical throws his plans for flight school off course. Unlike his war-hero older brother, Lukas's purpose is unclear. He can't fly, and in the eyes of the military, he's good for only one thing—the front lines. From the foxholes of war-ravaged Luxembourg to the devastation of an enormous German offensive, Lukas's journey is fraught with peril. But when he's taken as a prisoner of war, he realizes life is about to get much worse. In the enemy camp, Lukas is viewed as a German fighting for the wrong side. Ripped from the innocence of an idealistic youth, he becomes a man beaten by the horrors of war. Now his only hope of survival is to hold tightly to his faith in God and his love of family and home. But even if he manages to make it out alive, can he ever be whole again? Audiobook Runtime Approximately 11.75 hrs. If the option existed, I would have given this SIX stars! It is one of Soward's best works. It is engaging, poignant, and thought-provoking. I loved it! DISCLAIMER: I was asked by the author to read and review this book and given an advance copy for free. However, my review is honest and forthright based on the content of the book in question and not influenced by outside factors. That being said, A. L. Sowards is one of my favorite authors of historical novels, and this book is on par with – and perhaps better than – the author’s previous works (which each got 5 stars from me). 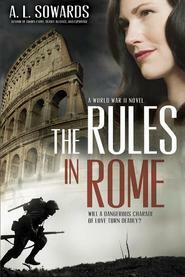 This book is connected to the excellent and dramatic “The Rules in Rome” (the protagonists in each book are brothers) but either is a standalone book that can be read without spoiling the other. Lukas Ley is 18; when he was 10, the Nazis took his father, and his family fled to the United States. He is in love with the girl who lived next door, but her father hates him because he’s German – and he wants to go fight against the evil people that took his father. He wants to be a pilot, but his eyesight and average grades not only keep him from his dream of flying airplanes (as a pilot or part of a crew) but also from becoming a paratrooper, so he is inducted into the infantry. Assigned to Luxembourg, he finds himself in the midst of what has comes to be called “the battle of the bulge” – a last, desperate offensive by the Germans to divide the Allies and prolong the war. The “defiance” of the title comes after Lukas finds himself a prisoner of war (this is on the jacket of the book, so no spoiler alert required) and is determined to survive. But will doing what it takes to survive fundamentally change who he is? And will that be a victory for the Nazis? This book is a bit different for the author, because it’s the first book she has written in first-person, and the impact of the story is more meaningful that way. Additionally, this book is action-packed. There was action in the previous books, but they also had a focus on a love story. This book, on the other hand, is almost all action (although there is a love story, but it not the primary theme of the novel). This was my first time reading a WWII novel but I'd heard wonderful things about other books by the author, A.L. Sowards.I was surprised how much I really liked this book, since this genre is out of my "reading comfort zone". Lukas Ley and his family (older brother, 2 older sisters and mother) immigrated to the United States from Germany 8 years earlier after his father is killed by the Nazis. Lukas is now 18 years old and recently graduated from high school,and can't wait to enlist to be a fighter pilot. His dream of being a pilot is shot down (so to speak) because of his vision and mediocre grades, and he ends up in the Army on the front lines in Europe. Shortly after being deployed he and others from his unit become prisoners of war while fighting in Luxembourg, and things get really bad when one of the other prisoners tell the German guards that Lukas was born in Germany. The author clearly has done a lot of research into WWII and is able to describe the scenes so realistically that I could picture them in my mind as I read. I'm thankful she doesn't feel the need for graphic details about how the characters were wounded. I received a copy of the book from the author for my honest review. I really enjoyed this book and plan to read some of her previous works. I have read several of A.L. Sowards' books, and she always weaves a well-written tale, with characters, events, and settings drawn with careful historical details. When I had the opportunity to receive a review copy of DEFIANCE, I took it! DEFIANCE is set near the end of World War II, and is told from the perspective of Lukas Ley. Lukas was born in Germany, but his family emigrated to America when he was ten, after his father was killed by the Nazis. Lukas is eager to join the fight against Nazi Germany, and does so as soon as he graduates from high school. The war tests and changes Lukas in ways he never anticipated. It amazes me to realize how young these soldiers were--Lukas is eighteen as he's dodging Nazi bullets and enduring the privations and terrors of war. This is not a fast-paced book, but rather a thoughtful exploration of Lukas's journey--physical, emotional, and spiritual. It begins with his eager naivete as he enlists; it takes us through his arrival at the front where he faces constant, terrifying danger, impossible odds, the challenges of bonding with and losing friends in his unit, the physical miseries of war, and the bitter hatred of a Nazi who has singled Lukas out as representing all he's lost. It concludes with his return home after the end of the war where he must cope with what he's become and find inner peace. Through Lukas's experiences, Sowards shows us that nothing about war is quick or easy, but among the miseries of war, love, loyalty, selflessness, courage, and gritty endurance also bloom. DEFIANCE is an interesting and eye-opening read. A heartbreaking WWII story that was well worth the read! DEFIANCE is a heartbreaking but inspiring story. A candidly told story about the struggles of one young man and his fellow soldiers during WWII from the front lines to various POW camps. It's also a story of survival, perseverance, forgiveness, and faith. Highly recommended! This author does such a fantastic job in writing relatable characters that you can't help cheering on. These characters that, as a reader, you have such hope for, who you cry for, and laugh with. I loved them all! I loved seeing Bastian and Gracie again and meeting Lukas' mom and sweetheart. I loved seeing Lukas' drive and hope. I enjoyed the letters and the eventual camaraderie between fellow soldiers. I'll be honest, the story was pretty tough in parts. War is tough and messy and scary. The author did a good job showing the realities of war, particularly this one, but not making it overly descriptive or grotesque. I could envision and understand what Lukas and his friends were going through quite easily and felt for them and the terrible things they dealt with. It makes me ever so grateful that Germany lost and for those who gave their lives and served to make it so. In the end, was it what I wished for? This was another fantastic release from this author! The journey was tough and definitely included moments of tension, heartbreak, and tears, but was also full of hope and joy. The ending was especially beautiful. Definitely well worth the read! Content: Violence due to war. Source: I received a complimentary copy from the publisher, which did not require a review nor affect it in any way. First, I love this cover. The picture within the picture is awesome and I feel like it fits the story so well. I love reading books by A. L. Sowards. You can tell that she does her homework because her stories come to life. They feel meaty, real and emotional. One of my favorite genres is historical fiction- just like this. War is never an easy subject to read about. While I loved this book, I had to read it in doses because my heart just couldn't take it all in one sitting. I had so many emotions reading this book- gratitude, heart break, anger, sadness, pride, hope, relief, but mostly gratitude. So many people have given so much- everything, really, to defend humanity from tyrants, to ensure freedoms and to defend what is right. It's humbling. This book brings all of this to the forefront for me. This is an amazing story of courage, hope, faith, and enduring through great tribulation. I highly recommend it to readers, especially those that love history. If you see this book getting 5 stars from most reviewers, there is a good reason why... because it truly deserves it! This book takes you on an emotional journey from 1940's America to the war-torn countries of France and Germany during World War II. Lukas is a great main character who can't wait to graduate and head to the war to bring honor to his family and his father who was killed by the Nazis years earlier. His older brother has just returned from the war along with a missing limb and a wife. His older brother Bastian tried to prepare him for what is ahead, but nothing truly can prepare you for the ugliness of war as Lukas finds out. Sowards does not hold back in this book and doesn't sugarcoat the brutality of fighting and killing the enemy or seeing your friends being killed next to you. This book was well researched and the author says in the notes at the end that she talked to many World War II veterans about their experiences. There were times the battle scenes were so intense I needed to take a break because I wasn't sure I was ready to read what might possibly happen to Lukas and his fellow soldiers. Some of these scenes are graphic as this book is about a war and the battles that took place and the treatment of POW's by their captors. None of this takes away from the wonderful writing and the story that Sowards has written. This is an amazing story of courage, hope, faith, and enduring through great tribulation. The title of "Defiance" is Lukas showing Defiance against the enemy and against his own doubts about himself and the will to survive. I've read most of the books written by A.L. Sowards and in my opinion, this book is the best. The emotions that this story stirs up in the reader definitely makes this a story you will remember for a long time.This book is for all readers that love historical fiction, especially Wold War II, and meant for readers older teens and up. I give this book a solid 5 stars as one that should be read and shared with others. Love the way this author writes about World War II! I really like the way this author writes her World War II books. I feel like that's a really confusing time in history and she does a great job making the whole time period make sense to me. I also really like her characters! Luke is an amazing guy and I really liked "seeing" life through his eyes. He had just graduated from high school and the only thing he wanted was to be in the war, and his reason is sound. He wants to be able to fight against Germany because the Nazi's had taken his father from their family when they lived in Germany and executed him. Wow! I had never really thought of what life might have been like for people in his situation during the war. He was loyal to the USA, but so many around him were unkind because he was born in Germany and lived there when he was young. It was interesting how during the fighting, he was an asset because he could speak German, but as soon as he was captured it was a liability. 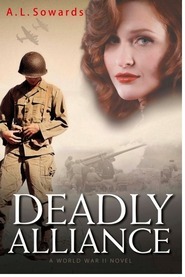 There is plenty of action in this book, it's about World War II after all. I didn't feel there was anything too graphic and the author did a great job keeping the language clean. In fact, I really liked the way Luke's brother, Bastien, advised him to watch his language and just continue being the good man that he already was, despite the demands of war. I liked the way Luke's perception of himself changed throughout the book. In the beginning, he seemed to think he was invincible, he was going to single-handedly end the war. Then as he goes through the experiences he has, he realizes that he's really nothing in the grand scheme of things. And I really liked the end, when he feels terrible about all he's been through and his brother helps him to know that it's okay and that through the Savior all will be made well. This part really hit me, because isn't that the way it is for all of us really. We try to do our best to do what's right, but we all make mistakes, and we all need him to help make up for those mistakes. I really enjoyed this great book! I can't wait for more by this author! This story is intense. Sowards did an excellent job with research and wove facts into this book so flawlessly that I felt like I was right there alongside Lukas through every scene–the fun ones with his girl back home, and all the ugly ones once he was shipped out to the front lines. My emotions got battered, and I wanted to cry a lot as kids got killed and the war revealed all its ugly heads. The battles in this book took place in Luxembourg as the Germans are trying to push their way through to Bastogne in a last ditch effort to win the war in 1944-45. The battle scenes and dialogue seemed so real to me. Like I said above, I felt like I was right there. I could smell the heavy scent of kerosene campfires and feel the ash and smoke smother me during the shellings and bombings. I felt Lukas’s fear as he shot at German soldiers and ran for his life. He eventually gets caught and as this book’s title suggests, the ultimate battle he must fight is to uphold his pride and dignity when the enemy is determined to beat him down as a POW. His spirit must show defiance, and hold true to his beliefs and humanity. This was an excellent book. Characters were developed and complex. The plot was intense and had lots of twists and tear-inducing scenes. The emotions it evoked were strong. No sitting on the fence with your heart for this book. Overall, it was the perfect book. I can’t think of anything I didn’t like about it. I’m still just sitting here feeling kind of awed by the story and what the character went through. Bravo, Amanda Sowards. This deserves awards. A.L. Sowards' new book Defiance is a must read for WWII fiction fans! It is an excellent story that I devoured. And, like Sowards other historical fiction novels, she is able to engage readers and really make them feel the horrors of war without bogging them down with graphic, gory, details. Sowards creates such deep characters. You can't help but become attached to them. I really liked Lukas, and I ached for him and his fellow soldiers. The friendships Lukas made were bright spots in a dark time. And the loss of many of those friends was deeply felt. I loved those that reached out when someone was about to give up-those that helped others carry on. There was a great message about forgiveness (both of others and yourself). This also felt perfect to read near Easter with the significance in Lukas' life of the atonement and Christ being able to make him whole. It has been over two years since I read the story about Lukas' older brother, Bastian. While both books are stand-alone, I definitely want to go back and re-read The Rules in Rome to refresh my memory about all that Bastian went through. Although his part in Defiance is pretty small, he is a great character that really helps Lukas both before, during, and after the war. Defiance is well written, and I highly recommend it, along with Sowards' other books.